Slideshow - Nothing Else Like It! Post 63 Adds Pitching Coach Nick Watkins to Staff ! To view the developing 2019 schedule, click on Link at left. 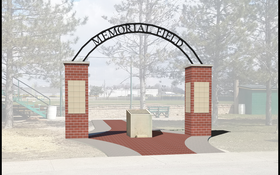 Memorial Plaques (8"x8") are still available to be placed on the Gateway Entrance Arch. (See picture below) A tax deductable donation of $1000.00 to the Memorial Park Capital Campaign entitles the donor to a memorial plaque. For more information contact Dave Kersh at davekersh56@gmail.com. POST 63 NAMES BRAYDEN SAUTTER AS NEW HEAD COACH....Doug Sanders, and Doug Sanders Jr. to assist! In 2016 a scrappy middle infielder named Brayden Sautter showed up at the Ottawa Legion Tryout Camp. A solid fielder, and reliable contact hitter, Sautter easily made the roster. Less than two weeks into the season he was the starting second baseman, and went on to lead the team with an impressive .418 BA. Sautter quickly emerged as a team leader due to his winning attitude and knowledge of the game. Now, less than 3 years later, Brayden Sautter has been named to lead The Fighting 63rd. If his emergence as a head coach mirrors his playing days, good times could be ahead for The Fighting 63rd. Sautter becomes the 30th head coach in Ottawa Legion Baseball history, which dates back to 1930. He currently is a junior at Bluffton University, and is a 2016 graduate of Ada High School. While in high school he was a four year varsity baseball starter, earning 1st Team All NWC honors in his junior and senior years. He is the JV baseball coach at Columbus Grove High School and a licensed basketball official. Sautter will be assisted by the seasoned Doug Sanders, who was an effective assistant coach for the Ottawa Legion in 2015 and 2016. Sanders brings an abundance of experience, and his soft spoken approach enhances his ability to communicate with the players. He is a student of hitting, both the mechanics and mental aspects. He graduated from Bath High School and Ohio Wesleyan University where he played four years of football and baseball. Also assisting will be Doug Sanders, Jr , who also graduated from Bath High School, and Ohio Wesleyan University, where he played football and baseball for four years. He also was an assistant coach in 2015 and 2015. Baseball Surges to #1 Youth Sport! Finally, Baseball is getting some good news about participation in the sport. Stunning news, really. Baseball - Softball has now surged to be the # 1 youth participation sport in the United States. This after a 3 year trend of growth, according to the annual report by the Sports & Fitness Industry Association. Participation in Baseball has shown an annual rise of 6.5% over 5 years, 10.7% over 3 years, 18.1 % from 2015 - 2016. The growth rate seems to be gaining momentum. The increase in participation almost certainly stems from MLB's "Play Ball" initiatve which was launced by the sport in 2015. This story was reported by Fox Sports and other news outlets.